Brian Bosworth was one of the most indelible and engrossing personalities of the 80s to hit the gridiron. Boz’s influence was so strong that his hairstyle, sunglasses, and personality transcended sports barriers and transferred to mainstream American culture- but to Brian, that was all ‘The Boz’. I had been looking for Brian since I re-started TTM collecting in 2010. A long time ago I got his Starting Lineup figure. One of the few unique figures in the set, they had gone as far as giving Bosworth his stylish haircut. I went as far as writing names, addresses on envelopes, and pulling cards, when I realized that he had not been responding to any TTM responses. I waited 6 years for a better shot at Brian while other peoples’ misses piled up. It was then a lot of things really fell into place. I watched the ’30 for 30′ presentation on him, simply titled ‘Brian and the Boz’. The show was an honest documentary on Bosworth’s life, but what really surprised me was that it all took place around the city I live in. It lastly took me seeing a post on a message board I frequent, discussing a recent success that somebody had contacting him through email. I found the email and gave it a shot. I was given a very specific pricelist (very) and instructions on how to pay through paypal. I went ahead and gave it a shot. A few days later, I got all 4 of these great cards back signed. Personalization doesn’t bother me since I keep them. I didn’t ask for ‘the Boz’ on the cards. -I just didn’t feel it was appropriate after watching the 30 for 30 documentary. Brian also answered my short questionaire. He told me that if he was a tree, he’d be a Palm tree, and that of the other teams he really wanted to play for, he was interested in Philadelphia, Chicago, and Dallas. 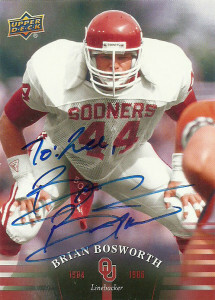 Brian Bosworth was one of the greatest linebackers ever to don pads. 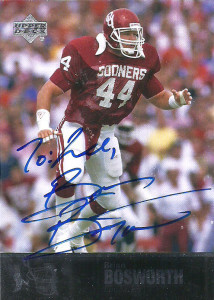 The only two time Butkus Award winner in history (annually given to the greatest linebacker in college football,) in 1985 and 1986, Bosworth also earned Consensus All-American Honors both years, as the Sooners powered their way to the National Championship in 1985. It’d be in 1987 that Bosworth garnered the attention of the NCAA and was suspended for the Orange Bowl. He declared for the NFL Supplemental Draft of 1987. Brian finished his career at OU with 395 tackles in only 3 years. Now Boz had a very thorough determination process for who he’d play for. He sent letters to all 28 teams, telling them if he’d like to play for them or not. Simply stated if he was drafted by a team he didn’t want to play for, he was just going to sit out until the next draft. Boz really wanted to play for the Raiders, but instead got selected by: The Seahawks… After initially rebuffing the Seahawks offers, Boz finally came to the table and signed an (at the time) incredible contract: 10 years, $11 million dollars. He came into the Seahawk lineup and helped bolster the defensive roster, giving the team a much needed ‘bad boy persona’ shooting his mouth off at the media, players, and fans. 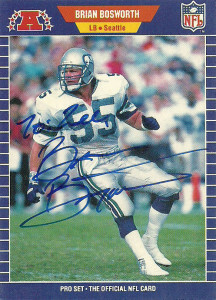 Boz played for the Seahawks for 2 and a half seasons, before a shoulder injury finally caught up with him. Boz flunked his physical -ending his football career. Brian had been dabbling in the media long enough that he had become a recognizable face. It didn’t take long for him to show up on Entertainment Tonight, appearing in his first movie ‘Stone Cold’. Since then he’s appeared in films, TV shows, commercials, and media. Bosworth was also a member of the Sunday Night XFL commentary crew in 2001. In 2015, Bosworth was finally inducted into the College Football Hall of Fame. Passed over numerous times by the selection committee – most of those involved felt that it was finally time. 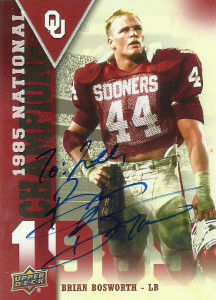 It was an honor to me that I felt was long overdue to Brian Bosworth.